Note: Triple tape, packaged in a TARDIS tin box. There were 7 different variations of the tin, each with a different picture of one of the first seven Doctors on the base. "Gentlemen, may I remind you that this is a court of law and not a debating society for maladjusted, psychotic sociopaths." Thus speaks the Inquisitor in an attempt to establish some order at the High Council of the Time Lords' trial of the Doctor. Charged with having engaged in conduct unbecoming to a Time Lord, the Doctor must defend his honour, reputation and indeed his life in the face of damning accusations from the Valeyard. Supported by irrefutable evidence from the Matrix — the High Council's record of activities of all the Time Lords — the case against the Doctor seems watertight. From the mysterious planet of Ravalox, to an encounter with Lord Kiv on the planet Thoros-Beta and on to an inter-galactic space liner in the year 2986, the Doctor's activities seem at best to have been unnecessary and at worst to have recklessly endangered the lives of others — including his two assistants, Peri and Mel! But who exactly is this prosecutor known as the Valeyard? Can the Council believe the evidence provided by the Matrix? And, indeed, should the Doctor trust the High Council of the Time Lords to provide a fair trial? Originally transmitted 6 September - 6 December 1986, this 14-part epic adventure is a welcome addition to the Doctor Who collection on BBC Video. It is available exclusively in this special limited edition tin to commemorate the programme's 30th anniversary. Note: Triple tape, packaged in a cardboard box. The title is misprinted as The Trial of the Time Lord throughout the packaging. 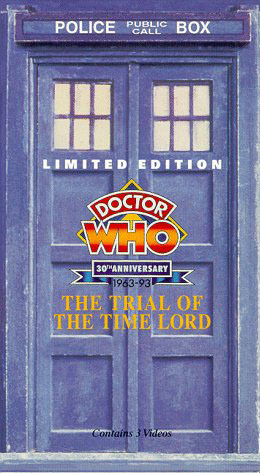 The three videos in this Limited Edition Boxed Set contain all four episodes of Doctor Who's immortal adventure, "The Trial of the Time Lord", starring Colin Baker as the Doctor. 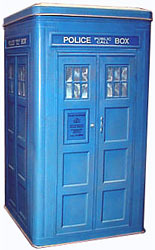 The saga begins when the Tardis is drawn into a mammoth space station. The Doctor emerges alone to face a tribunal of the Time Lords, and placed on trial for cosmic interference. The trial begins with a screening of the Doctor arriving on Ravolox. The cosmic prosecutor, Valeyard, builds his case against Doctor Who, with evidence recorded in the Matrix and through the Tardis. The Doctor's most recent adventure is introduced as evidence of his guilt. Doctor Who presents his case, a story from his near future that occurs after he has met a new companion, Melanie. Finally, in "The Ultimate Foe", the truth is revealed. Note: Unusually, the outer packaging was imported from the UK and simply had Australian rating stickers slapped over the UK certification on the tin. However, the videotapes inside were manufactured and duplicated in Australia — this being the case, it technically counts as a separate Australian release.